As the “petite” among the Style Common girls, I was challenged to make this bold, longer length tank work for a shorter frame. To prevent the top from overwhelming the look (and to add length to my legs)I tucked it into a high-waisted skirt. Since I had decided to style the look to be a slightly more corporate, office-party appropriate one, I slipped on a scarf to conceal the low neckline and was all set to go! Check out the same tank styled on different bodies and for varied occasions here, here and here! The tank looks great! I always love sequins. 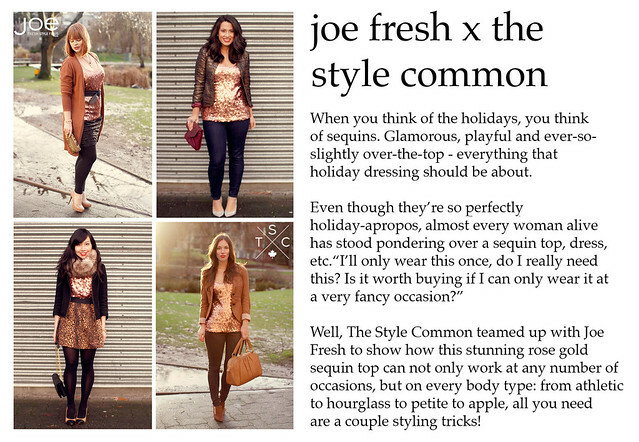 I just wish I lived in a city with a Joe Fresh that offered the full range! We miss out on a TON of the best pieces on PEI – but rumour has it e-commerce might be happening soon = fingers crossed! Yahoo! Love this pally. And who made that woooonderful graphic????? Oh ya…me. Let’s do pics soon, miss you! Your version of this top is my fave, Jen! The sequins paired with faux fur and leopard is so much fun, and I love that your look would be instantly party perfect just by taking off the scarf and jacket. This look is so you Jen! Love how you play with texture and pattern here. You may be petite, but you have big style! Love it! I am a new follower after having you bookmarked forever. Aw, super cute, Jen! I love that you all styled the same tank and it works so well on all of you! I love it tucked into the skirt & the scarf makes it even more glam! Nice looks! I wished it also featured slim waist frame or the ruler body shape.